Sea Cloud II has announced its new program from October 2012 to January 2013 with fantastic savings on offer for bookings made before 30 June 2012. 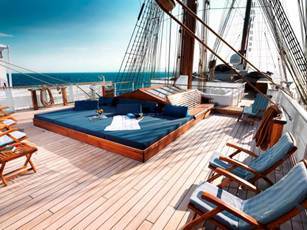 The stunning windjammer will ply the waters of the Western Mediterranean taking in the fascinating ports of Spain, Portugal, Sicily and Sardinia. She will then sail through the spectacular Canary Islands before heading to the idyllic Lesser Antilles and Grenadines in November. Small ports, stunning landscapes and places of historical significance are the canvas for a unique experience on a windjammer cruise on board the luxurious Sea Cloud II. There are a number of incredible savings available for cruise itineraries between November 2012 and January 2013 for bookings made before 30 June 2012. · Savings of up to €1,990 per person for a 12 night/13 day cruise from 07-19 November 2012 from Valencia, Spain to Las Palmas, Gran Canaria which includes ports of call in Cadiz, Lisbon, Funchal, San Sebasatian and Los Cristianos and the opportunity to visit the enchanting Garajonay National park, a UNESCO world heritage site. The 12 night cruise leads in at €2,995 per person for a guaranteed double cabin if booked before 30 June 2012, normally €4,985 per person. · For those who love days spent sailing at sea there are savings of €2,700 per person available on a 15 night adventure departing Las Palmas on 28 November and sailing into Barbados on 13 December 2012. Rates lead in at €3,425 per person for a guaranteed double cabin for bookings prior to 30 June 2012, normally €6125 per person. Sea Cloud II combines the best of traditional sailing with all the modern amenities and offers nostalgia along with a wonderful sense of freedom. With a crew of 65 the 94 guests on board can be assured their experience is more like being on a private yacht than a cruise ship. Sea Cloud Cruises offers a clear, reliable price structure with all meals included and personally selected wines and soft drinks just as much a part of the package as the bottle of champagne in every cabin to welcome each passenger. Sea Cloud Cruises offers a fleet of luxurious vessels that sail the oceans of the world and the finest rivers of Europe. Luxury and the personal, private atmosphere of small intimate yachts are the common elements of all vessels of Sea Cloud Cruises. A blue chip cruise operator since 1979, the Berlitz Cruise Guide has awarded it five stars for many years, most recently in September 2010. The River Cloud II is a floating five-star hotel that takes only 88 pampered guests on the Rhine, Main, Danube and the Black Sea to Europe's most beautiful destinations. The River Cloud II has a crew of 35 and exudes Mediterranean elegance and charm and yet stiff formality is avoided at all times. The Sea Cloud Fleet currently includes two five star windjammers: the legendary Sea Cloud, built in 1931 for wealthy businessman's wife Lady Marjorie Merriweather Post now restored to her former glory and her sister ship SEA CLOUD II which combines nostalgia with the latest in modern comfort. Sea Cloud II has 47 outside cabins and a crew of 65 for a maximum of 94 guests. Sea Cloud offers only 32 outside cabins, (some with original marble bath) and a crew of 60 for only 64 passengers so impeccable and personal service is assured.